NFL/football broadcast experience: Play-by-announcer for Tulane football games since 2007; Saints beat reporter for Sports 1280 from 2003 to 2006. Hopefully he could swing both Tulane and the Saints. For sure on the Wave baseball front. I would be good for Tulane to have another Saints connection also. Hoping this works out the way Graf wants, but gosh it's hard to imagine Wave football broadcasts without his passion. As the voice of the Green Wave I believe he has a full time job. I also believe it's his dream job. If he took the Saints gig, which has always been a part time job per the article , he'd have to give up the Tulane job as he would have to travel with the Saints and couldn't do football anymore. I can't see him being interested. Nice that he was mentioned. Of course he would want that job. It would be huge and a nice pay raise for him and his family. He’d still be able to call Wave baseball without any conflict and much of MBB if he choose to do so. Now with that said I’d be surprised if Sean Kelley doesn’t get it since he’s good and is already on Benson’s payroll. It’s an honor just to be considered should Graff not get it. We'll have to agree to disagree. The job is part time so not sure of the pay. Also they'll get a new voice of the Wave for at least football and basketball if he went. I just read this had to laugh. Who here besides winwave thinks Graff if offered turns down the Saints. Show Me wrote: I just read this had to laugh. Who here besides winwave thinks Graff if offered turns down the Saints. The Saints job would give Graf national exposure and a chance at an even bigger assignment. I'm pretty sure he would take it no matter how great his affection for Tulane. Jim Henderson did a few national broadcasts and originally saw the Saints gig as a stepping stone. He took the local job because it gave him the chance to run his own sports department following the legendary Hap Glaudi. Whenever I think of Tulane football, Todd G. is the voice I will hear in my head. I hope this works out in the best possible way for him. So he has a full time gig with Tulane that he has as long as he wants it. The Saints radio job is a part time gig and he would have to give up the full time job he has for it. The Saints don't pay the announcers. They work for Entercom. Poor ratings and you're gone. The scenario fits Hoss well. His child is probably old enough that he wouldn't mind the travel now. He turned down being the sports anchor on WWL TV when Henderson left b/c he knew he'd be sent on the road to cover them b/c of his child. If Kelly can keep his Pels job he'd be interested too. The job doesn't get you national attention. People know the national TV guys but couldn't name the local radio guys. But hey continue with your hate fest. It's all you got. Sean Kelley already does the preseason Saints games on TV. He’ll easily transition to the radio booth. He’s employed also as a host on the Saints' digital media platform. I have a copy of his resume. Hoss has no PBP experience. He has property next door to a friend of mine’s house in Bay St Louis he loves the water and enjoys his semi-retirement I don’t know if he’d want the added workload. tpstulane wrote: Of course he would want that job. It would be huge and a nice pay raise for him and his family. He’d still be able to call Wave baseball without any conflict and much of MBB if he choose to do so. tpstulane wrote: Sean Kelley already does the preseason Saints games on TV. He’ll easily transition to the radio booth. He’s employed also as a host on the Saints' digital media platform. I have a copy of his resume. Hoss has no PBP experience. He has property next door to a friend of mine’s house in Bay St Louis he loves the water and enjoys his semi-retirement I don’t know if he’d like the added workload. I agree he could do it but only if he can keep the Pelicans job. The Saints job doesn't pay what some think it does. tpstulane wrote: Sean Kelley already does the preseason Saints games on TV. He’ll easily transition to the radio booth. He’s employed also as a host on the Saints' digital media platform. I have a copy of his resume. Hoss has no PBP experience. He has property next door to a friend of mine’s house in Bay St Louis he loves the water and enjoys his semi-retirement I don’t know if he’d want the added workload. No one knows the number obviously. However as I have said it is a part time job and everyone that has had it had other jobs. Henderson was the sports anchor on the most watched station for decades. That's where he made his living. All the others hosted multiple radio shows in addition to it. Emotion makes some think it's the be all, end all but it's not unless you've got other things lined up. In Graff's case IMG ( if thye are the one's that still own our rights)isn't going to pay him and someone else. Football drives the bus and if you can't handle that then you aren't going to be the voice of the Wave. I hope not. Sorry guys I can’t handle Mr doom and gloom like you all. Find Graffiti very difficult to listen to. I imagine whoever gets it would be brought into the fold as a full time hire with various other gigs and shows under Benson and the Saints umbrella. Henderson was a special case because he did it for so long and was universally loved as the play by play guy. He called his own shots. This is why Kelley prob makes the most sense because he’s already in house, but if they hire someone else I would think they would create other things for that person to do so that it would be a full time job such as coaches shows, radio shows during the week on 870, tv shows, other promotional hosting events etc. Henderson didn’t have to do any of that and was willing and wanting to be part time. The next Voice of the Saints will likely be a full time hire with many obligations and opportunities. My bet is Mike Hoss. sader24 wrote: I imagine whoever gets it would be brought into the fold as a full time hire with various other gigs and shows under Benson and the Saints umbrella. Henderson was a special case because he did it for so long and was universally loved as the play by play guy. He called his own shots. 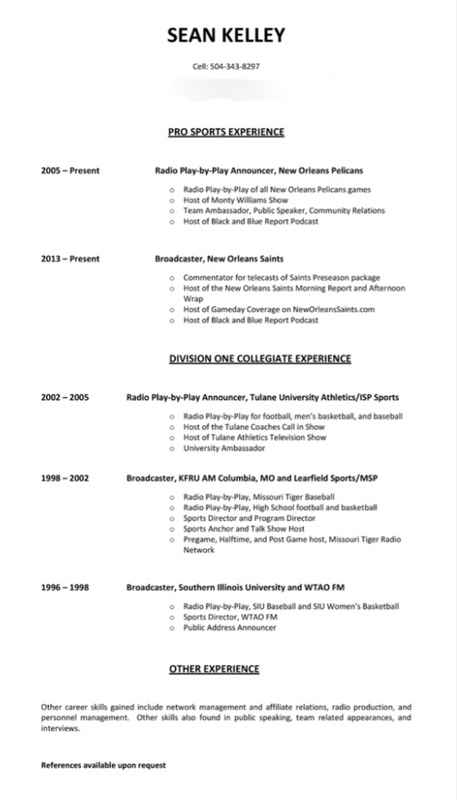 This is why Kelley prob makes the most sense because he’s already in house, but if they hire someone else I would think they would create other things for that person to do so that it would be a full time job such as coaches shows, radio shows during the week on 870, tv shows, other promotional hosting events etc. Henderson didn’t have to do any of that and was willing and wanting to be part time. The next Voice of the Saints will likely be a full time hire with many obligations and opportunities. My bet is Mike Hoss. Hoss is already a Saints sideline reporter so he could get elevated. It would be interesting to see if he wants to move upstairs and call every play in the booth. You really have to love it to want to do PBP it’s much different than sideline reporting or doing color for that matter. There’s no breaks and it’s a job that takes a lot of preparation off the field. And like you said it may likely require many more off the field obligations then currently required. Hoss will be the fan favorite but I’m not convinced he’d be the best choice for PBP job. The voice of the NY Football Giants is not a full time position. Bob Papa is on the NFL network and has other gigs, including work with the golf channel as well. But he does do other shows like "Giants 1st and 10" which may or may not be part of his Giants contract. As for the Saints position, I nominate our own Golfnut69 as the man. He's probably better fit for color commentary, but he's a good choice to get behind the mic in my opinion! If Graff takes the Saints gig, then lure Jim Henderson out of retirement to do Tulane football only. Since Jim likes to have former football players as color commentators, get Matt Forte to do that. Then you would have two guys with NFL experience (broadcasting and playing) doing college football. Find a couple of broadcast newcomers to do Tulane basketball, and then work out something to have Graff return to do Tulane baseball. Note: I can think and dream just as outrageously as the next guy, folks. Seriously though, having Jim Henderson's voice do Tulane football would boost the number of listeners (if Tulane would find a radio station with RANGE on it --- 104.1 FM maybe). IM42lane wrote: If Graff takes the Saints gig, then lure Jim Henderson out of retirement to do Tulane football only. Since Jim likes to have former football players as color commentators, get Matt Forte to do that. Then you would have two guys with NFL experience (broadcasting and playing) doing college football. Find a couple of broadcast newcomers to do Tulane basketball, and then work out something to have Graff return to do Tulane baseball. I found an FM station that our games come on and it’s crystal clear. If you can get HD radio (my car can) Tune in to 101.1 FM HD2 on your radio. It’s the same broadcast as 1280AM only it’s in stereo and comes in excellent. Update. This position is a WWL radio position. WWL will select the person while the Saints will only have the right to veto. The job will be a full time position. Although Tulane would be ok with Graff doing both it’s unlikely that WWL will allow that. An announcement should be coming soon. Non compete different station. He won’t do Tulane games. Perhaps if by miracle Tulane gets picked up by WWL or it’s affiliate station then maybe. But as it stands today Tulane has already sold its media rights to IMG through 2026 so that’s not likely. But is Graff actually in play for the Saints job?